I hope you're sitting comfortably, this is a long one. When I go away I make lists. Lists of what I need to pack but even after checking everything and rechecking it, I always have the sinking feeling I've forgotten something. When I went away last month I checked I had everything numerous amounts of times. It wasn't until the morning after I'd arrived, that I'd woke up fresh faced, ready to do my makeup - only to realise I hadn't packed my foundation! Of all the makeup products I could have forgotten. It would have been utterly ridiculous for me to hot foot it to M.A.C to drop £25 on Matchmaster, which I have over half a bottle of already. It wasn't lost so there was no need to replace it. I did however make a beeline to Boots. 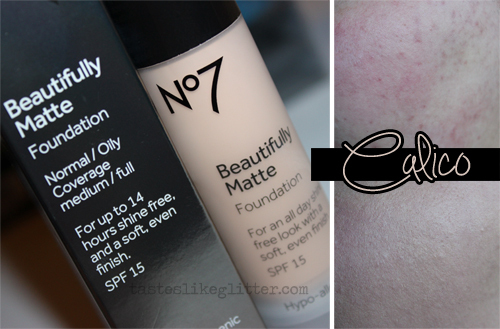 It was a good excuse to try out their new No7 'Foundation Match Made' service. It's like nothing I've seen before, which I think is why people are so curious about it. It's something they've worked on for over 3 years. They use a gadget with a built in database they've created to take photos of the skintone on either side of your face. Each click (which only takes a second or two) takes 27 photos. Then it tells you exactly which shade you are. You can find your closest counter that offers this service by selecting it from the additional services drop down here. I of course ended up being the palest shade. Though I didn't think the colour match would be quite pale enough. Top photo - daylight, no flash, no primer, no editing, no nothing. Bottom photo - same light, same bit of my cheek, just Beautifully Matte and nothing else. No7 Beautifully Matte foundation formula has been tested to provide a shine free look for up to 12 hours. Salicylic acid had been included in the formula to help unblock pores and improve the condition of the skin throughout wear. It leaves your skin shine free - essential for anyone with oily skin. Minimising the appreance of pores, leaving a more flawless complexion. With SPF15, it helps protect the skin from the damaging effects of the sun. Ethanol leaves your skin feeling cool and refreshed. The formula has been tested to ensure it won't block pores and high levels of colour pigments means the coverage is relatively opaque with a silky matte finish. There is no powdery, grey finish associated with some matte foundations and overall looks flattering to the skin. I don't claim to have perfect skin. In fact when people say I do from looking at photos on here, I will fight the fact I don't. It's just good lighting, the use of flash and foundations with SPF. The camera blurs over my skin. I will also admit I do 'shop out blemishes because no one wants to see that. You're here for the makeup! However this post seems a bit redundant if I did that for these swatches. The point is to see how it really looks and if it lives up to it's claims. Anyway! I so wish I'd listened to everyone growing up when they told me not to pick my spots (ick!). It's left my skin covered in scarring that looks a lot like acne. The whole point of this post was the review. I didn't intend for this to be so long, oops! I opted for Beautifully Matte as my skin is more combination than anything else but I do get quite an oily nose. So I wanted something that could help keep me shine free without having to layer lots of powder on top. I use this with a Real Techniques Buffing Brush. It blends in perfectly to the skin without much effort at all. The colour is also spot on, which is a first. Usually high street foundations don't go anywhere near pale enough. I love this. It lasts all day and still looks as good when I take it off as it did when it first went on. I do find I have to powder my nose a tad just to keep it completely shine free but I'm not applying nearly as much powder as I used to. Overall I am extremely pleased with this foundation. I always dismissed No7 but I cannot recommend this highly enough. I really do love it, I've found myself reaching it for pretty much everyday since I got it.